“’…to the Glory of God Almighty and Omnipotent, and for the spread and maintenance of the Christian religion in its sincere form, for the eradication of errors and heresies, for the increase and perpetuation of true loyalty, for the extension of good literature of every sort, for the knowledge of languages, for the education of youth in loyalty, morality, and methodical learning, for the relief of poverty and distress, and lastly for the benefit and well-being of the Church of Christ in our realms, […] we have decreed that a College of learning in the sciences, philosophy, humane pursuits, knowledge of the Hebrew, Greek and Latin languages, to the ultimate profession of Sacred Theology, to last for all time to come, be created, founded, built, and established….’**Elizabeth I, 27 June 1571” (“All the Welshmen Abiding and Studying in Oxford”). Quite an ambitious set of goals. Elizabeth, in the context of all the ecclesiastical changes occurring in England, was taking an important step by establishing the first Protestant College in Oxford. The Charter language was not ambiguous; its purpose, clearly stated above, was for the “benefit and well-being of the Church of Christ in our realms.”’ Clergymen were, consequently, to be educated beyond theology in an array of subjects from the sciences to Hebrew. Interestingly, although as the first Protestant ‘Renaissance’ institution Jesus College was important, a more direct influence on the college was the attraction of Welsh scholars (to be discussed later in fuller detail). While commonly called Jesus College, Oxford, its formal name is quite impressive: “Collegium Jhesus infra civitatem et Universitatem Oxoniae ex fundatione Reginae Elizabethae, Anglice vero [Jhesus College wythin the Citie and Universitie of Oxforth, of Quene Elizbethe’s fundacion]” (Statutes of the Colleges of Oxford 5). Organized by the Letters Patent to consist of a Principal, eight Fellows and eight Scholars, the college would be given the “usual corporate rights of holding, defending, acquiring and alienating property, ut pars, parcella et membrum ejusdem Universitatis’” and empowered to “accept a bequest from Price of £60 a year, and other property up to £100” per annum from beneficiaries (Salter and Lobel). Included in the charter was the permission to acquire the site and buildings of White Hall and to appoint eight commissioners to draw up the statutes for the governing of the college. All the appointees would be “according to Dr. Price’s mind” (Ingram 37). The foundation charter listed out the space the college would physically occupy when Queen Elizabeth “gave the greatest parte of the ground whereupon the College is built” (Salter and Lobel). In Oxford there had been many survivors of “previously much larger numbers of academic halls, which offered student accommodation but little formal discipline or teaching” although many of these halls were independent and had their own Principals (The Beginning). Despite the autonomy of the halls, oftentimes, individual colleges absorbed them. Dr. Price’s task therefore, of locating a suitable site to provide for the physical aspect of his dream to “bestow his estate of the maintenance of certain scholars of Wales to be trained up in good letters” probably was not as difficult as may seem with multiple halls available (Ackermann 141). Accordingly, has shown in the history of Jesus College, the lands Elizabeth I granted in her Royal Charter of Foundation, contained a “certain Religious House or Cell called Whyte Hall, (which before the Dissolution of Monastries belonged to the Priory of St. Frideswide) for the site of the College” (A Pocket Companion for Oxford 84). King Henry VIII and his Lord Chancellor, Cardinal Wolsey, had ordered the investigation and eventual dissolution of the Augustinian Priory, St. Frideswide, which had been located in Oxford from the early 1100s upon the original site established by St. Frideswide for her more modest abbey in the 600s (St. Frideswide is the patron saint of the city and university of Oxford). The King’s agents suppressed the Medieval priory in April of 1524 “in accordance with Wosley’s scheme for the erection upon its site of a great college” (“Houses of Augustinian Canons”). Unfortunately for Wolsey, his fall and death prevented the final establishment of Cardinal College and eventually Henry VIII took advantage and created Christ College. Many of the St. Frideswide buildings became part of the new institution after 1546. Therefore, 25 years later when Dr. Price was searching for a location to establish Jesus College, White Hall, which dated back to the 13th century and was described as “a large tenement with a great stone gate”, was available (Jesus College, Oxford 29). The location of Jesus College on the “land which was given by the queen extended from Ship St. to Market St., and … was occupied by two tenements; on the north was Little White Hall, facing the city walls; on the south was Great White Hall in Market St. (or Chayny Lane) belonging to St. Frideswide’s” (Salter and Lobel). *** These two buildings along with Lawrence, part of Lincoln College, merged to be referred to as White Hall. Several other student hostels (one identified as Elm Hall, another Plummer) and a buttery, attached to White Hall all along Turl Street, were also added (Hardy 11 & 17, Allen 109, Moore 238, Chalmers 393 and Salter and Lobel). E. G. Hardy, writing in his extensive history of Jesus College, does believe that the land “no doubt was purchased with Dr. Price’s money, and then generously bestowed upon the new College by its royal Foundress” (Hardy 11). Other sources, H. E. Salter and Mary Lobel amongst them, claim that the land was in the possession of the Crown after the dissolution of St. Frideswide and was simply granted by Elizabeth to Price. Regardless, property east of Great White Hall, “fronting Market St. and Turl St., and there built what the Benefactors Book calls ‘all the old Buildings towards ye East and South …. If the Benefactors Book is accurate, they must have been built between 1571 and 1574 when Price died” (Salter and Lobel). Regardless of whether Elizabeth donated the Crown lands or Price purchased them, it is clear that “the timber for building is said to have come partly from Shotover and Stow forests, grants being made by Queen Elizabeth for this purpose” (Oxford Architectural and Historical Society 186). To ensure the rights to the properties, once the land was being populated with buildings, the College acquired a lease from Lincoln College for Laurence Hall (which was paid at £2 per annum until 1816–Salter and Lobel) plus paid a quit-rent to Christ Church for White Hall which was initially 26 shillings and 8 pence, but it had been reduced before 1631 and listed as 8 pence until 1833 when the property was purchased out-right (Jesus College, Oxford 31). Officially and charmingly, the land was described in Christ Church’s records as extending “from the Street to the Walnut tree; & in breadth from the Bowling Alley to the mud-wall, although no measurements were given” (Jesus College, Oxford 31). Below is a portion of a bird’s eye view of Oxford looking from the north, originally drawn by Ralph Agas in 1578. Oxonia antiqua instaurata sive urbis & academiae Oxoniensis topografica delineatio olim a Radulpho Agas impressa A.D. 1578 nunc denuo aeri incisa A.D. MDCCXXII (1578). The original map was damaged, but it has been reproduced with this copy engraved by W. Williams in 1732. It shows streets and buildings pictorially – High Street runs from left to right with St Mary’s Church at the center. In the lower -right side can be seen the city wall with the North Gate just visible at the right” (Agas). The new buildings of Jesus College “from the gateway to the corner of Cheyney Lane” [Market Street] are shown as is White Hall and some of the other Halls, at the corner of Ship Street—the rest of the site is still garden (Hardy 18-19). Agas’s plan shows Laurence Hall as “an isolated group of buildings standing to the south and west of the present Ship Street/Turl Street corner” (Allen 110). Figure 1 — Allen, Brigid. “The History of Jesus College, Oxford, 1571-1603.” Oxoniensia, 108, Vol. LXIII, 1998. Oxoniensia.org. Web. 22 June 2016. <http://oxoniensia.org/volumes/1998/allen.pdf>. 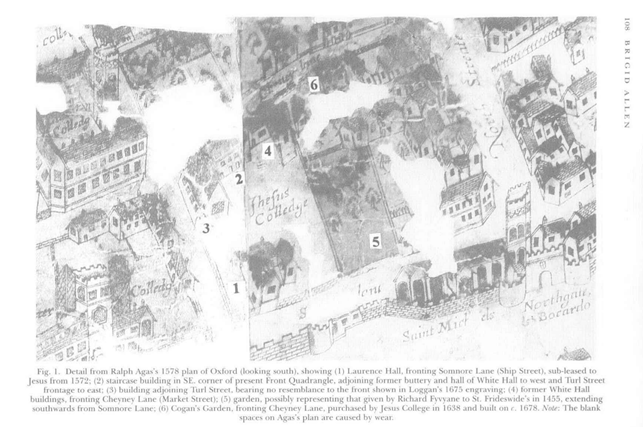 Above is a detail view from Ralph Agas’s 1578 plan of Oxford (looking south), showing (1) Laurence Hall, fronting Somnore Lane (Ship Street); (2) adjoining former buttery and hall of White Hall to west and Turl Street frontage to east; (4) former White Hall building, fronting Cheyney Lane (Market Street); (5) garden, possibly from St. Fridenswide’s Priory, extending southwards from Somnore Lane (Allen 108). Figure 2 —Map of Oxford. Part of Ralph Agas’s Map of Oxford (1578). North is at the Bottom. Jesus College, Oxford is Marked in Green. Digital image. Wikipedia. Wikipedia.com, Aug. 2012. Web. 7 July 2016. <https://commons.wikimedia.org/wiki/File:Ralph_Agas_map_of_Oxford_1578_Jesus_marked.jpg>. Figure 3— “Jesus College, Turl Street, Oxford, United Kingdom.” Map. Google Maps. Google, 25 July 2016. Web. 25 July 2016. (“Statutes of Jesus College, Oxford V1.7 Statute One”). ***The main buildings of Jesus College are located in the centre of the city of Oxford, between Turl Street, Ship Street (also known as Somnore Lane and Jesus College Lane), Cornmarket Street, and Market Street (previously called Cheyney Lane). Allen, Brigid. “The History of Jesus College, Oxford, 1571-1603.” Oxoniensia Vol. LXIII, 1998. Oxoniensia.org. Web. 22 June 2016. <http://oxoniensia.org/volumes/1998/allen.pdf>. Agas, Radulpho. Oxonia antiqua instaurata sive urbis & academiae Oxoniensis topografica delineatio olim a Radulpho Agas impressa A.D. 1578 nunc denuo aeri incisa A.D. MDCCXXII (1578). University of Oxford: Highlights of the Bodleian Library’s Map Collection. Shelfmark: Gough Maps Oxfordshire 4. Web. 7 July 2016. <http://www.bodleian.ox.ac.uk/__data/assets/pdf_file/0006/108771/Highlights-of-the-Bodleian-Librarys-Map-Collection-v1.pdf>. Map of Oxford. Part of Ralph Agas’s Map of Oxford (1578). North is at the Bottom. Jesus College, Oxford is Marked in Green. Digital Image. Wikipedia. Wikipedia.com, Aug. 2012. Web. 7 July 2016. <https://commons.wikimedia.org/wiki/File:Ralph_Agas_map_of_Oxford_1578_Jesus_marked.jpg&gt;. Google Maps. 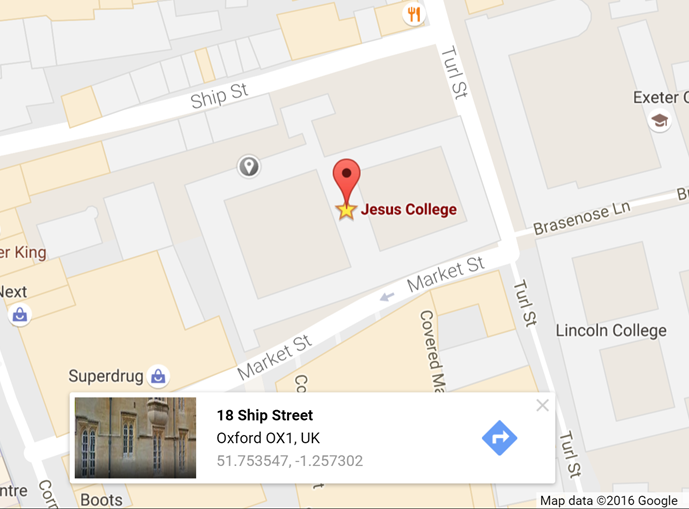 “Jesus College, Turl Street, Oxford, United Kingdom.” Map. Ackermann, R. “Jesus College.” A History of the University of Oxford Its Colleges, Halls and Public Buildings Volume II. London: L. Harrison & J. C. Leigh, 1814. Google Book Search. Web. 17 July 2016. <https://books.google.com/books?id=hBZPAAAAcAAJ&pg=PA236&dq=history+of+oxford+ackermann&hl=en&sa=X&ved=0ahUKEwiy5oj3yf3NAhXK1CYKHcfTBQ8Q6AEIJzAC#v=onepage&q=history%20of%20oxford%20ackermann&f=false>. “All the Welshmen Abiding and Studying in Oxford: Transactions of the Honourable Society of Cymmrodorion 1986.” Llyfrgell Genedlaethol Cymru. Aberystwyth: The National Library of Wales, 2009. Cylchgoronau Cymru Ar-lein, Welsh Journals Online.org. Web. 15 Jan. 2016. <http://welshjournals.llgc.org.uk/browse/viewpage/llgc-id:1386666/llgc-id:1422443/llgc-id:1422616/getText>. “The Beginning.” Jesus College Oxford. Jesus College Oxford.ac.uk. 2016. Web. 6 Feb. 2016. <http://www.jesus.ox.ac.uk/about/the-beginning>. Oxford Architectural and Historical Society. “Walks and Excursions, Lent Term, 1883. Saturday, Feb.17, 1883.” Proceedings of the Oxford Architectural and Historical Society, New Series, Vol. IV, 1880 to 1885. Oxford: Parker and Co.,1885. Google Book Search. Web. 19 July 2016. <https://books.google.com/books?id=QjUGAAAAQAAJ&pg=PA239&dq=Proceedings+and+Excursions+of+the+Oxford+Architectural+and+St.+Frideswide&hl=en&sa=X&ved=0ahUKEwjT4u21tILOAhUBwiYKHVQ_DewQ6AEIHDAA#v=onepage&q=Proceedings%20and%20Excursions%20of%20the%20Oxford%20Architectural%20and%20St.%20Frideswide&f=false>. Cook, John Douglas, et al. “Jesus College, Oxford.” The Saturday Review of Politics, Literature, Science and Art, Volume 89: 532. London: The Saturday Review, 28 Apr.1900. Google Book Search. Web. 24 June 2016. <https://books.google.com/books?id=84s_AQAAIAAJ&pg=PA532&lpg=PA532&dq=second+letters+patent+jesus+college+oxford+1589&source=bl&ots=EtyuDCz0-h&sig=aS3yZPIvIfC8SG4i5T-GphjN8HI&hl=en&sa=X&ved=0ahUKEwipq52H0MPNAhWJKyYKHcVpBjEQ6AEIJDAC#v=onepage&q=second%20letters%20patent%20jesus%20college%20oxford%201589&f=false>. Fuller, Thomas. “The Church-History of Britain from the Birth of Jesus Christ Until the Year M.DC.XLVIII.” 1845 Edition. Oxford: Oxford University Press, 1845. Text Creation Partnership.org, 2005-2012. Web. 4 July 2016. <http://quod.lib.umich.edu/e/eebo/A40655.0001.001/1:91?rgn=div1;view=fulltext>. Hardy, E. G. Jesus College. University of Oxford, College Histories. London: F. E. Robison and Co., 1899. Archive.org. Web. 22 June 2016. <https://archive.org/details/jesuscollege08hard>. “Houses of Augustinian Canons: The Priory of St Frideswide, Oxford.” A History of the County of Oxford: Volume 2. Ed. William Page. London: Victoria County History, 1907. 97-101. British History Online. Web. 14 July 2016. http://www.british-history.ac.uk/vch/oxon/vol2/pp97-101. Ingram, James, Ed. “Jesus College.” Memorials of Oxford Volume II. Oxford: John Henry Parker, 1837. Google Book Search. Web. 16 July 2016. <https://books.google.com/books?id=6jkuAAAAMAAJ&pg=PR166&lpg=PR166&dq=bestow+his+estate+of+the+maintenance+of+certain+scholars+of+Wales+to+be+trained+up+in+good+letters&source=bl&ots=KeEl-ESiyE&sig=liLIIQ0uupOTq-iZ_P5U_Cp6uSA&hl=en&sa=X&ved=0ahUKEwjjp8eIvv3NAhXF0iYKHR7lCmEQ6AEIKjAE#v=onepage&q=bestow%20his%20estate%20of%20the%20maintenance%20of%20certain%20scholars%20of%20Wales%20to%20be%20trained%20up%20in%20good%20letters&f=false>. Jesus College, Oxford. Ed.Wikipedians. Google Book Search. Web. 5 Feb.2016. Map of Oxford. Part of Ralph Agas’s Map of Oxford (1578). North is at the Bottom. 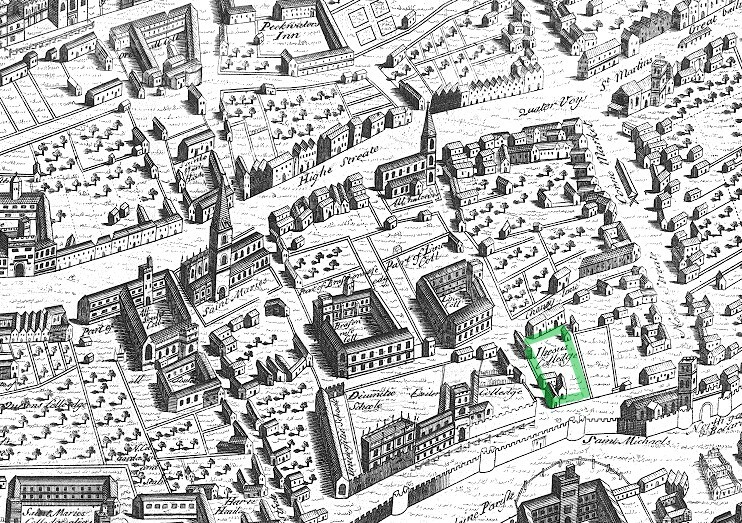 Jesus College, Oxford is Marked in Green. Digital image. Wikipedia. Wikipedia.com, Aug. 2012. Web. 7 July 2016. <https://commons.wikimedia.org/wiki/File:Ralph_Agas_map_of_Oxford_1578_Jesus_marked.jpg&gt;. Moore, James. The Historical Handbook and Guide to Oxford: Embracing a Succinct History of the University and City from the Year 912, Second Edition. Oxford: Thomas Shrimpton & Son, 1878. Google Book Search. Web. 17 July 2016. Oxford Architectural and Historical Society. “Walks and Excursions, Lent Term, 1883. Saturday, Feb.17, 1883.” Proceedings of the Oxford Architectural and Historical Society, New Series, Vol. IV, 1880 to 1885. Oxford: Parker and Co.,1904. Google Book Search. Web. 19 July 2016.<https://books.google.com/books?id=QjUGAAAAQAAJ&pg=PA239&dq=Proceedings+and+Excursions+of+the+Oxford+Architectural+and+St.+Frideswide&hl=en&sa=X&ved=0ahUKEwjT4u21tILOAhUBwiYKHVQ_DewQ6AEIHDAA#v=onepage&q=Proceedings%20and%20Excursions%20of%20the%20Oxford%20Architectural%20and%20St.%20Frideswide&f=false>. Plummer, Charles, ed. Elixabethan Oxford: Reprints of Rare Tracts. Oxford: Oxford Historical Society, 1887. Archive.org. Web. 25 June 2016. A Pocket Companion for Oxford: Or, Guide Through the University. Oxford: Clarendon Printing House, 1766. Google Book Search. Web. 23 Feb. 2016. <https://books.google.com/books?id=AZYDAAAAQAAJ&printsec=frontcover&dq=jesus+college+oxford&hl=en&sa=X&ved=0ahUKEwirjN6LtMjJAhUJaT4KHesUAgg4WhDoAQg3MAI#v=onepage&q=jesus%20college%20oxford&f=false>. Salter, H. E. and Mary D. Lobel led. “Jesus College.” A History of the County of Oxford: Volume 3, The University of Oxford. London: Victoria County History, 1954. 264-279. British History Online. Web. 21 June 2016. http://www.british-history.ac.uk/vch/oxon/vol3/pp264-279. Statutes of the Colleges of Oxford; with Royal Patents of Foundation, Injunctions of Visitors, and Catalogues of Documents Relating to the University, Preserved in the Public Record Office Vol. III. Oxford: J. H. Parker, 1853. Web. Google Book Search. 17 July 2016. “Statutes of Jesus College, Oxford V1.7 Statute One.” Jesus College, Oxford. Jesus College, Oxford.ac. Web. 25 June 2016. <http://www.jesus.ox.ac.uk/sites/default/files/all_statutes_071015.pdf>. “Statutes of Jesus College, Oxford V1.7 Statute Two.” Jesus College, Oxford. Jesus College, Oxford.ac. Web. 25 June 2016. <http://www.jesus.ox.ac.uk/sites/default/files/all_statutes_071015.pdf>. “Statutes of Jesus College, Oxford V1.7 Statute Fourteen.” Jesus College, Oxford. Jesus College, Oxford.ac. Web. 25 June 2016. <http://www.jesus.ox.ac.uk/sites/default/files/all_statutes_071015.pdf>. “Visual Arts and the Gothic.” Gothic Literature: A Gale Critical Companion. Ed. Jessica Bomarito. Vol. 1: Topics. Detroit: Gale, 2006. 475-526. Gale Virtual Reference Library. Web. 6 Dec. 2015.